Foreign Language Free - New options for a table OFLAMERON for the study of the French language. 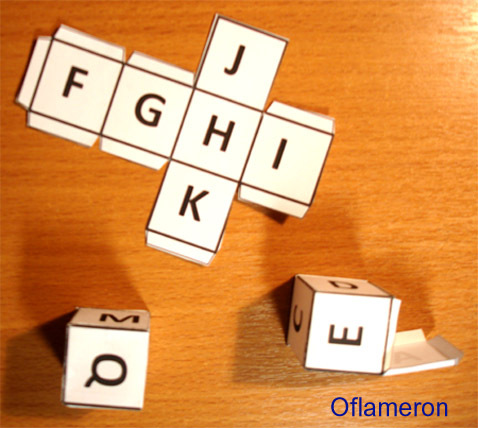 Board game Oflameron for the vocabulary skills of French language. For the game requires two colored dice cube with sides 1-6 (in this example, red and blue cube). The number of scores shown by the blue die is a vertical coordinate of the cell. 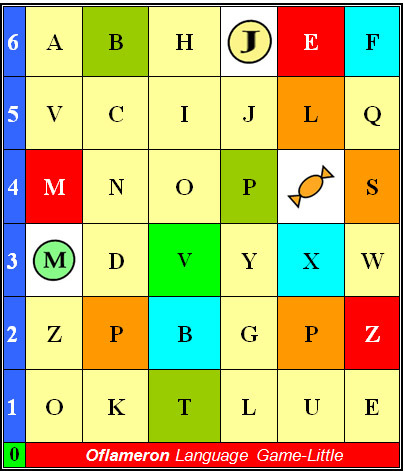 The number of scores shown by the red die is a horizontal coordinate of the cell in the playing field "Oflameron". Players roll all the dice and write the letters of the French alphabet. Who will be the first to make the translations of the word in English, and he won. If you only have a black and white printer, cell better Desaturate and then paint pastel pencils. For "bleaching" you must select a cell or the entire table and press the right mouse button. In the menu that opens, select "Borders and shading" and select the "Fill". To set the white fill or no fill. In different versions of Word placement of these items may vary.